As the number of working parents continues to grow, so does the demand for quality babysitting services. This growth makes it an ideal time to begin or expand the marketing of your babysitting venture. And while websites and social media are certainly great ways to promote your services online, babysitting flyers offer a creative, cost effective, and tangible way for you to reach potential clients directly and quickly. 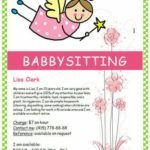 If you’re looking for an eye-catching and engaging advertisement flyer to spread the word about your babysitting services, we’ve put together a collection of templates to help you getting a babysitting job without breaking a bank. Save money– Whether you’re just starting babysitting or have been doing so for years, you’re likely on a tight budget. Using flyers can help you reach a large audience without breaking the bank. Find clients fast– Most of your babysitting customers will likely be located within a five to ten-mile radius of you. 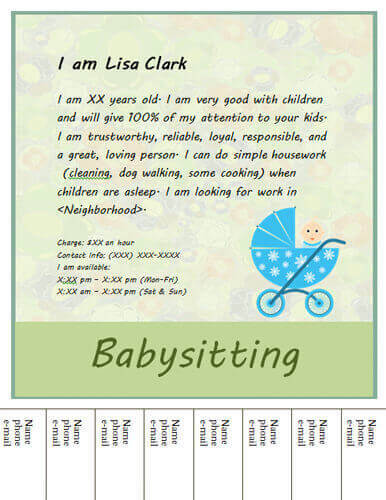 Handing out or placing babysitting flyers right in your community can help you find potential clients quickly. Measure your success– By using social media or a unique website, and putting a QR code, a coupon, or a discount code on your flyers, you can easily assess the effectiveness of your flyers and adjust your marketing method accordingly. Attractive and kid-friendly design with green and white checked border. The pink and white colors are used to create a soothing feeling of love, care, and affection. The pretty clip art of a fairy is to show the magic of love and attention. Headline or Title– Your headline or title should grab the attention of your potential clients by including your name and a slogan or catchphrase. Ages and Areas You Serve- Make sure you clearly identify the age range and locations you serve. Including specifics like names of subdivisions and streets can be a plus. Services You Provide– Clearly list your services, including any special ones such as transportation provided, before and after school care, night time, overnight or weekend babysitting. If space allows, you can also include information regarding your insurance/bonding, certifications (e.g. CPR), years of experience. Testimonials– Don’t just toot your own horn, let your clients do it. Include a testimonial or two from some of your happy clients and their kiddos, with photos if possible. Contact Information– Remember to include the best way(s) for you to be contacted. Add your phone number, email address, website, and social media accounts to make finding and employing you as easy as possible. With easy flyer maker programs like Microsoft Word, Canva, and Adobe Spark, you don’t have to be a graphic designer to produce a babysitting flyer that looks professional and impressive. Software programs like these offer tips, tutorials, and free flyer templates that are ready to use, and you can even upload your own flyer. Quality graphics and images– Although you’re marketing babysitting services you want to avoid a flyer that looks like a kids’ project. Choose graphics and photos that are relevant and engaging, as well as parent and kid friendly. Including pictures of yourself, happy babies and children, animals, and nature are all very effective. Clean fonts and engaging content- Use fonts that are easy to read and words that help convey trust, reliability, and maturity. You should also be clear on the steps you’d like your potential clients to take by using a call-to-action phrase such as: sign up today, contact me, visit my website, etc. Libraries, community and recreation centers– Each of these neighborhood hubs typically have bulletin boards, free events, and kids’ programs where you can leave your flyers for others to pick up at their convenience. With your family and friends– Children’s birthday parties, holiday gatherings, and celebrations are all great occasions to share your services with the people who know you best. Allow them to help you spread the word about your services. Schools, local nurseries, and day cares- Some schools and care providers may be happy to share your babysitting flyers, particularly if you offer services during times that they do not (e.g. nights, weekends, holidays, etc.). Social media– Social channels like Facebook, Instagram, and Twitter are great places to market your services to parents as well as local and community organizations. Most social sites will also allow you to upload your babysitting flyer. Online message boards– Social networking services for neighborhoods, like Nextdoor.com and JustMyNeighbors.com, are prime places to reach stay-at-home moms, grandparents, and other caregivers in need of your services. Distribution services- If you have an extensive budget, you may want to consider using a flyer distribution service. These companies can help you target, track, and deliver your flyers to reach customers who earn a specific income, live in certain neighborhoods, have children, and other demographics that you specify. 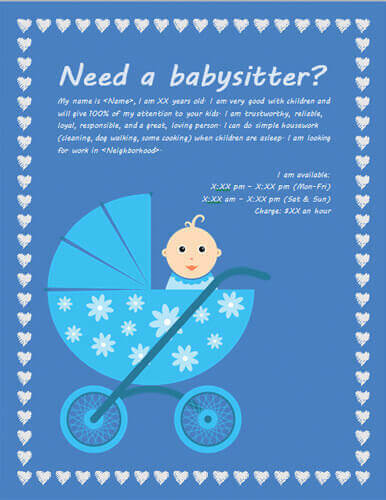 Below are 15 printable flyer designs you could use for babysitting or daycare services. Whether you’re looking for something cute and sassy or professional and classy, we’ve got a template for it. Each of the templates below can be edited in Microsoft Word. 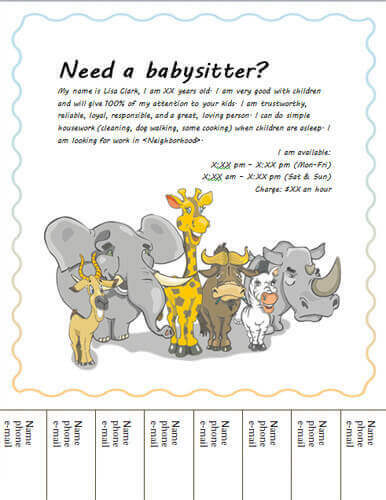 Our day care flyer examples can also be easily used to promote babysitting services. Bright and colorful design with an image of a baby robot. Colors and graphics are main focus of this sample. Design with bright colors and image of a mom holding a baby. This flyer addresses mothers (need a day off? need a night out?). Sample design with images of two cute kids, a girl and a boy. This example is a tear-off flyer and it is meant to be used as a poster in grocery shops, churches, work places where parents can see it. Another tear-off sample with an image of a cute baby. Sample design with a picture of a funny alien-like creature with big eyes. This flyer has a lot of space so it will work best if you have a lot of text. This design shows a picture of a blond girl, it's pink and it has cute hearts framing the page. Simple design with image of animals. This is a tear-off flyer sample. Bright blue design with picture of baby carriage and blue hearts making a frame for the flyer. Floral design with beautiful green patterns, ornament, and flowers. Bright and attractive design with big letters "baby" as a main focus of the page to attract the attention. This flyer has little space for text and only shows main information such as name, phone, and availability. Simple template with a picture of a dog sitting on green grass. Title (babysitting) is in large green letters to attract attention. Pink-colored theme with an image of a cartoon rabbit dancing and singing. Purple-color theme with beautiful flowers and color gradients. Simple design with image of a monkey playing drums. Simple tear-off flyer sample with green flower background. Plenty of space for any information you might want to include.